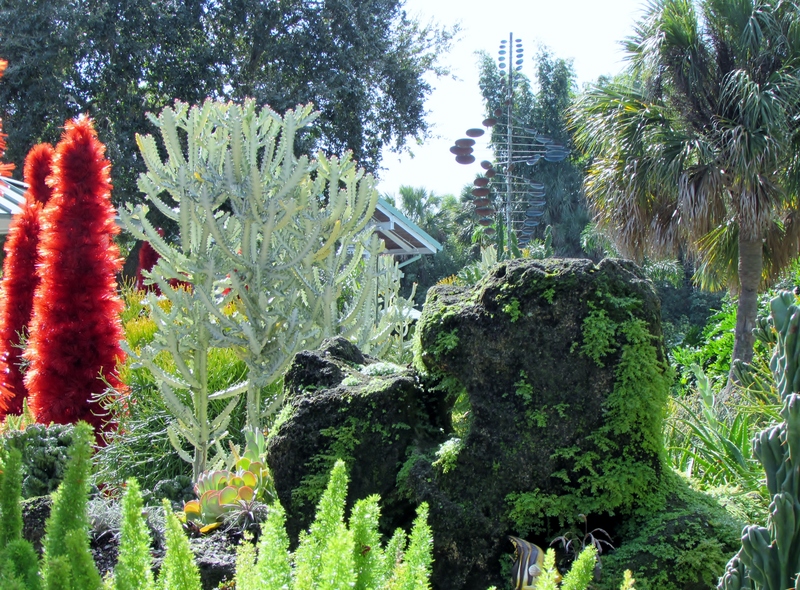 Sea World Orlando from a gardener designer’s point of view. 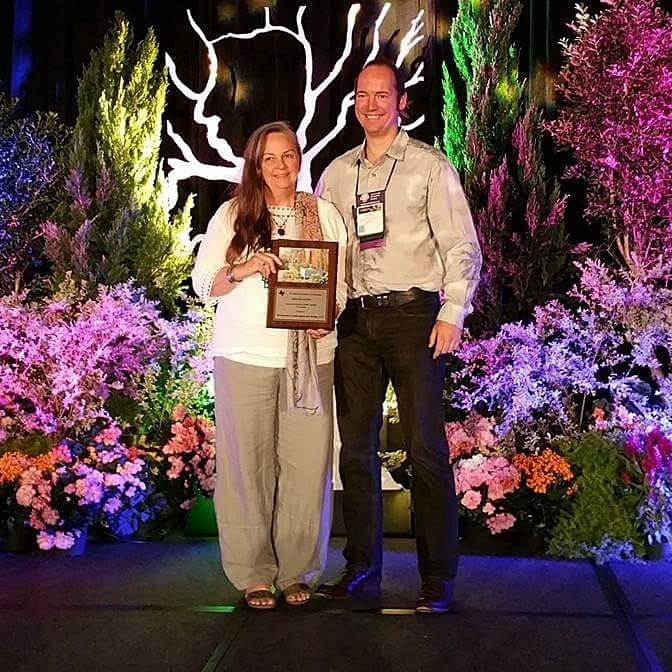 I am back from the APLD 2014 International Design Conference in Orlando Florida. My trip was wonderful and very educational. I have several designs waiting but I will try to catch you up with my week in Florida. 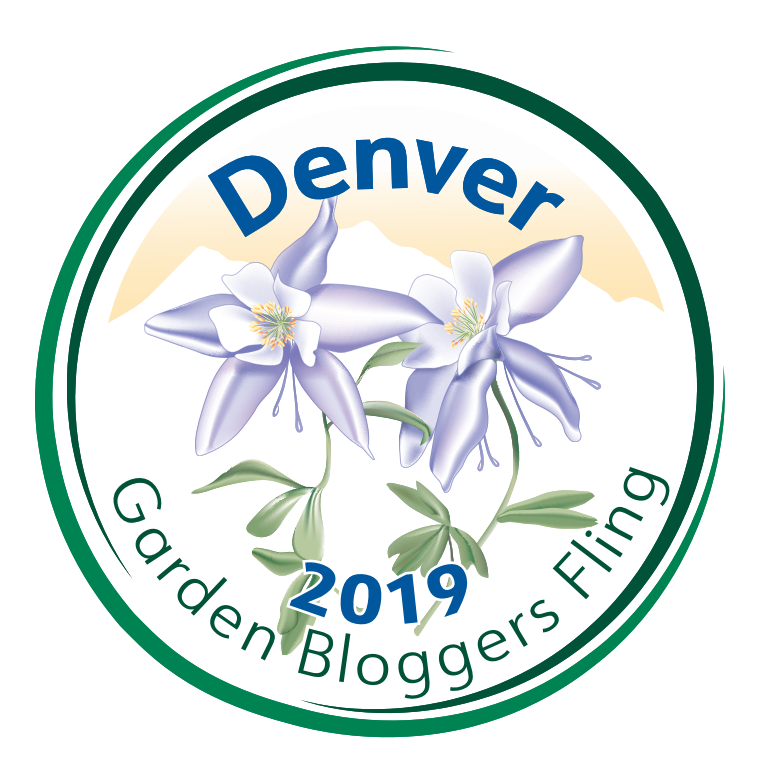 I thought the next two weeks I will post about gardens I toured during my visit. The first tour was at SeaWorld. When my children were young we used to have passes to SeaWorld in San Diego. 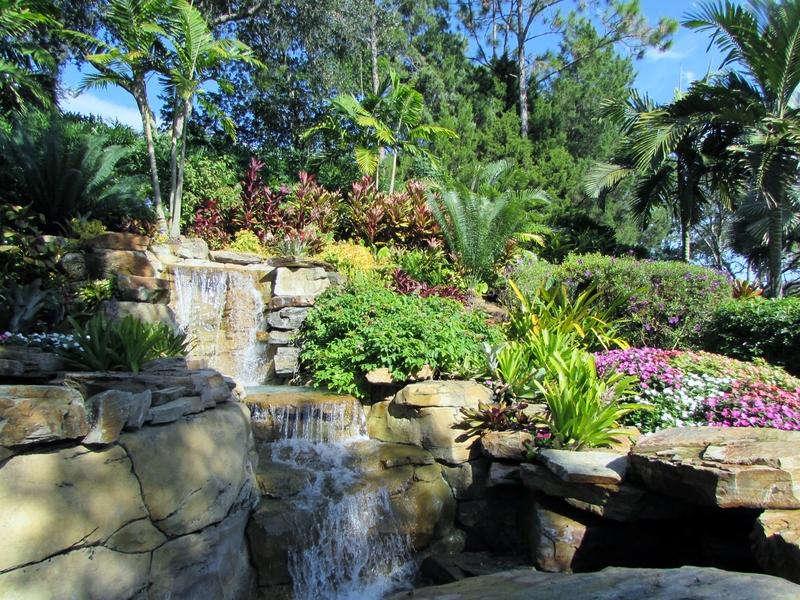 It was interesting to see another SeaWorld landscaped with more tropical plants that can deal with the summer heat and humidity of central Florida. Our tour was lead by the head horticulturalist and two staff. One was very knowledgeable about the flowering plants and the other the larger shrubs and trees. 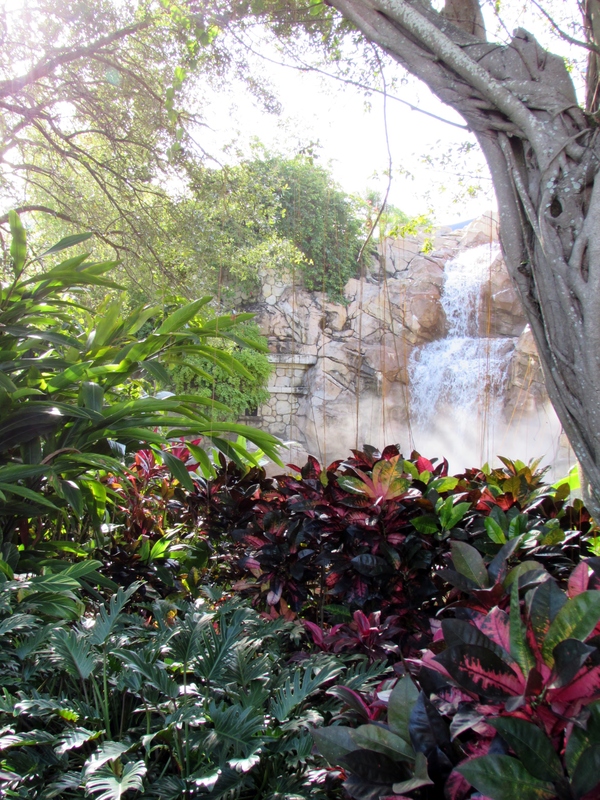 We learned about what goes into keeping the park lush and tropical while hosting millions of people every year. Putting annuals in pots makes changing them out easier and causes less damage to the roots of the palms they are under. With Halloween behinds us they are in the process of decorating for Christmas. 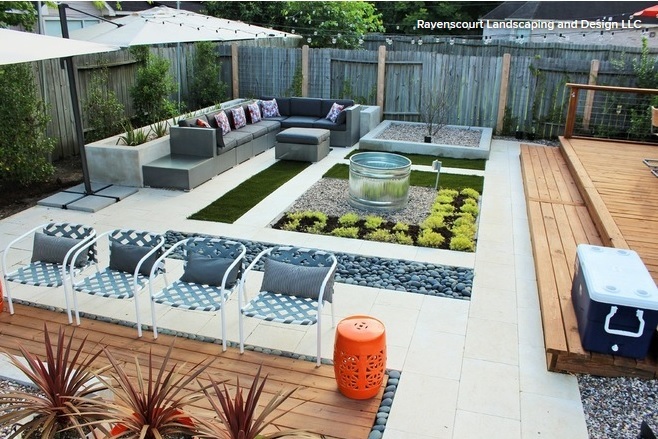 They work with a strict budget and are slowly turning turf-grass areas into perennial beds. 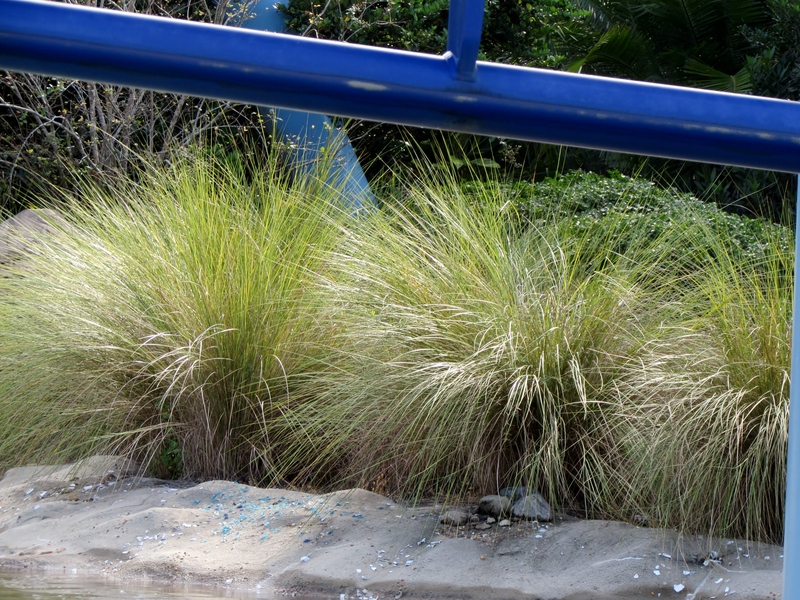 I noticed the use of ornamental grasses throughout the park. Orlando is zone 9b. Houston is zone 9a to the north and zone 9b to the south, the line breaks near I-10 going east to west. I saw many plants that we also use here in Houston. Plants are used to create frames for views, like of this waterfall. 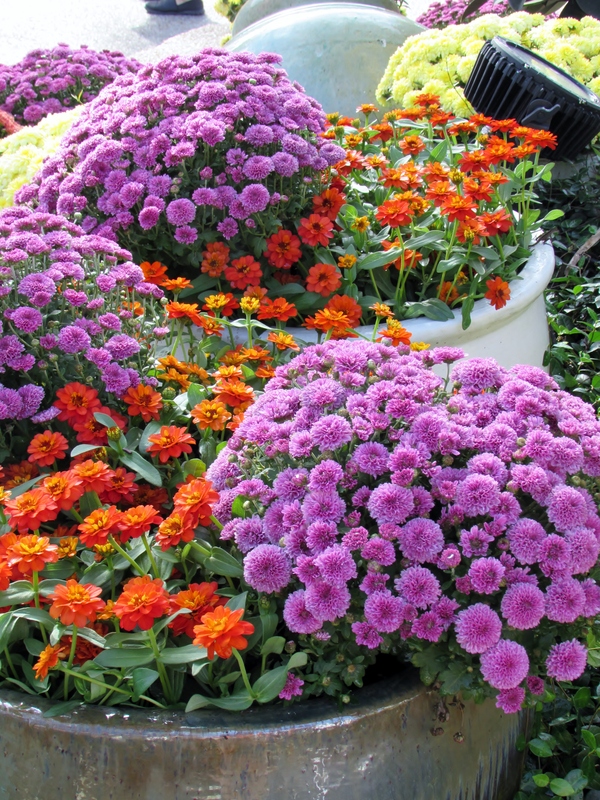 They use annuals to make the beds more attractive and colorful. Touring a garden where most of the group can’t grow the plants we are seeing was very interesting. I love hearing about all the different climates. The people traveling from up north were really enjoying the warmth even though we did get pretty hot and sticky. 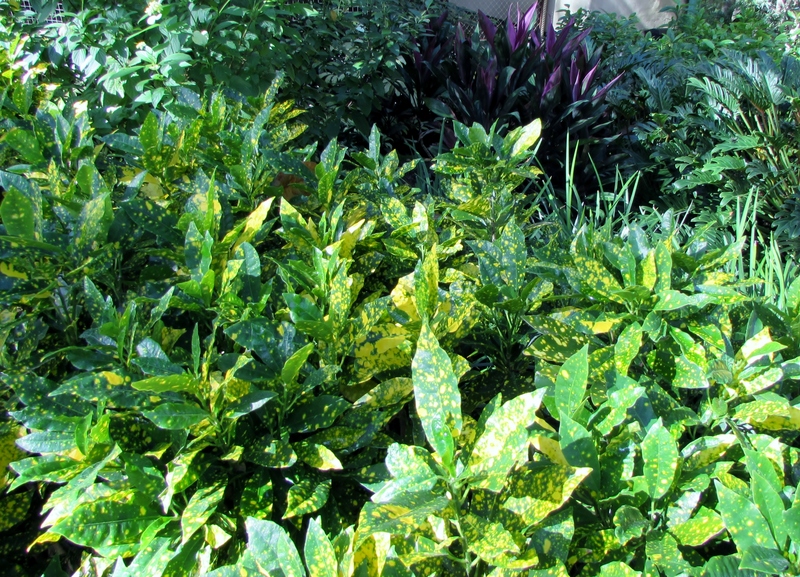 Aucuba Gold Dust, Aucuba japonica ‘Variegata’ is a favorite of mine. It does very well right through our hard freezes. Sometimes the top leaves get burnt but it recovers quickly. And they keep their bright yellow even in shade. 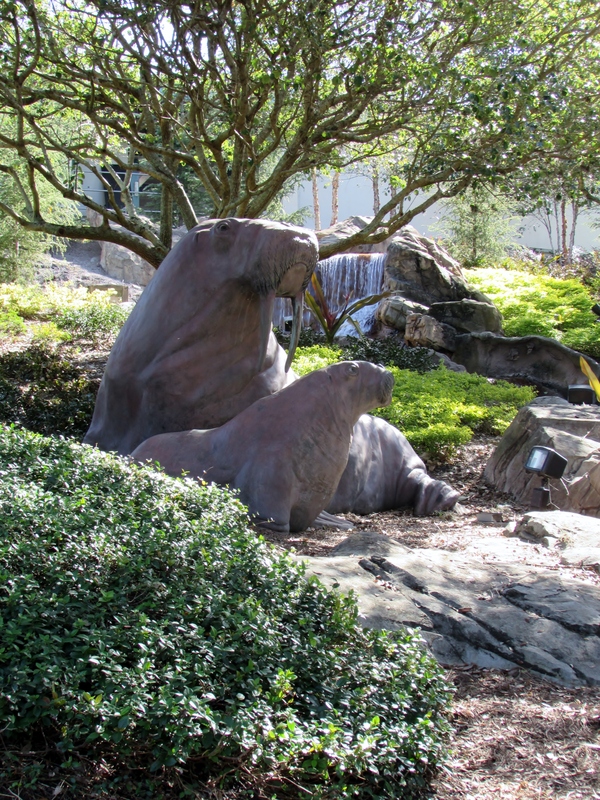 We didn’t go into any of the shows but besides enjoying the landscaping we also got to see sculptures, like these sea lions. 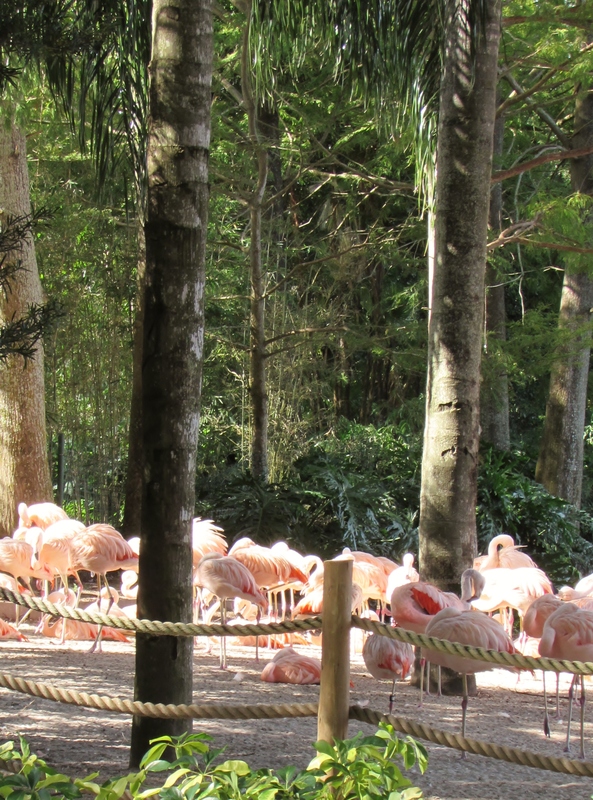 We saw live animals too, like these lovely peach flamingos! 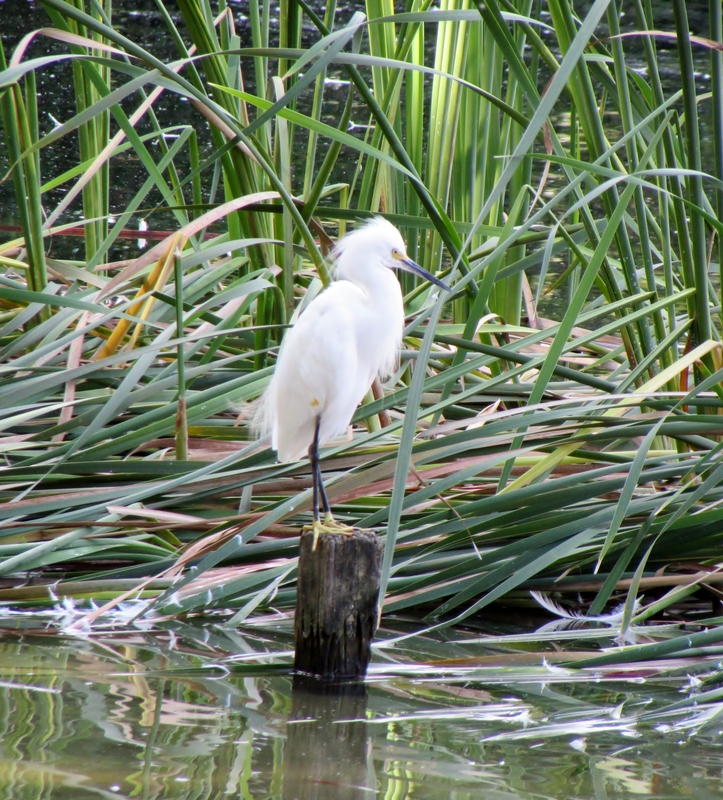 I am pretty sure this is a Snow Egret. They are suppose to be very common birds in south Florida, and can even be seen foraging in the surf. The park is broken into several different areas. This one is suppose to look like it is under the sea. They had already decorated it for Christmas. I can imagine this as the ocean floor! Can’t say I ever imagined mass planting Snake plants, Sansevieria trifasciata. 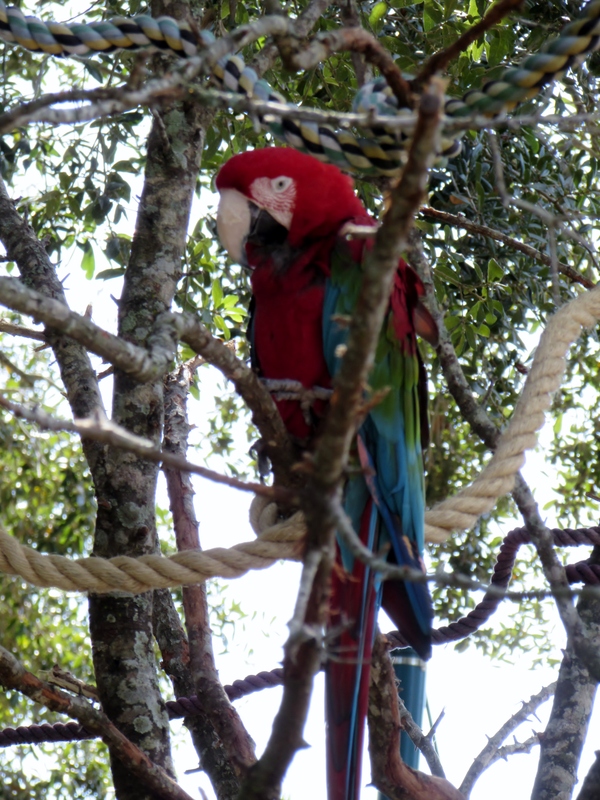 Up above there are live parrots in the trees. 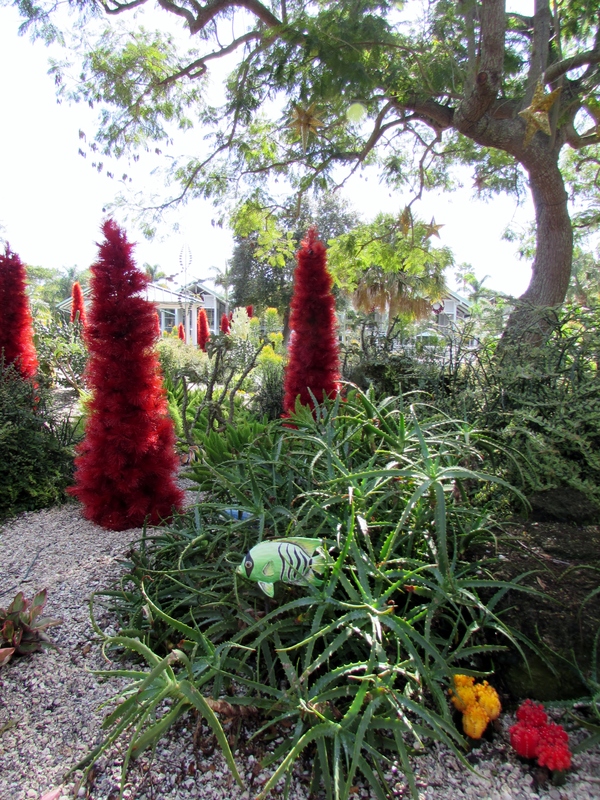 I loved the contrast of red and green. This garden was composed of very low water need plants to create the eerie effect of plants on the floor of the ocean. In the photo above on the left side you can just catch a large Firestick plant or Sticks on Fire, Euphorbia tirucalli. Here was a large Candelabra cactus, Euphorbia lacteal “White Ghost” . I have a really small one in a pot. Little fish were tucked all around to help with the sense that you are under water. The bright yellow and red cacti in the bottom right corner are real. 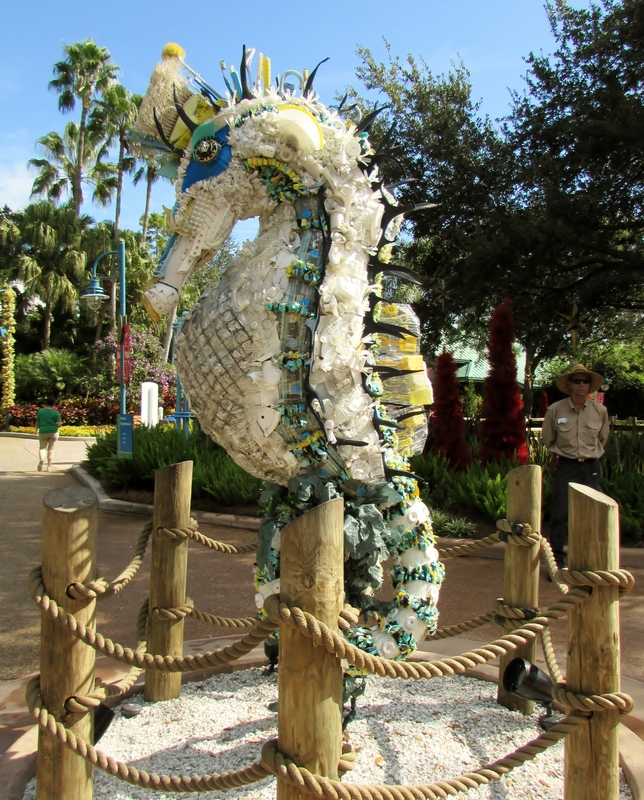 I loved this sea horse statue. Then I found out it is made entirely of trash found washed up on the beach. I hope it makes people more aware! In the background is one of our guides. He knew about the trees and larger shrubs. 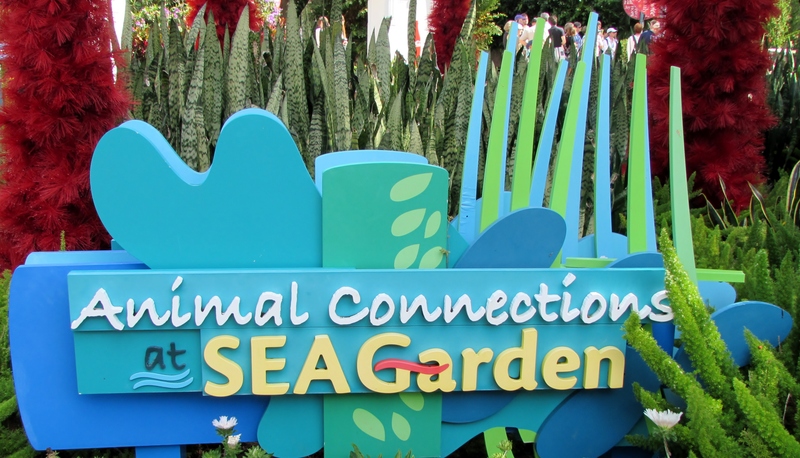 I never realized that theme parks would have so many educated and trained horticulturalists on their staff. They are really doing a great job of keeping the landscape healthy and beautiful. 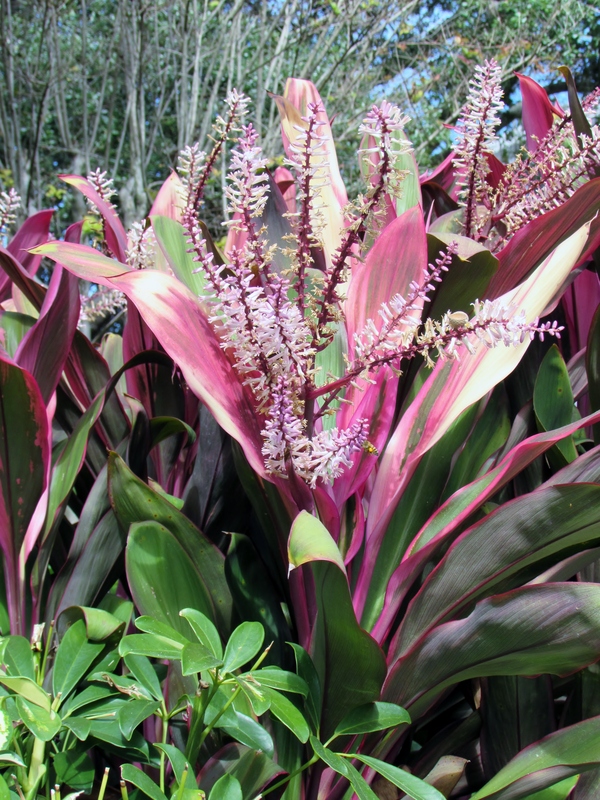 We use Cordyline in Houston is often used as an annual because it will die in a hard freeze. They can also be used as a house plant. Cordyline terminalis, some times called Ti plant. It was great too see plants we have here in Houston but rarely see in bloom. 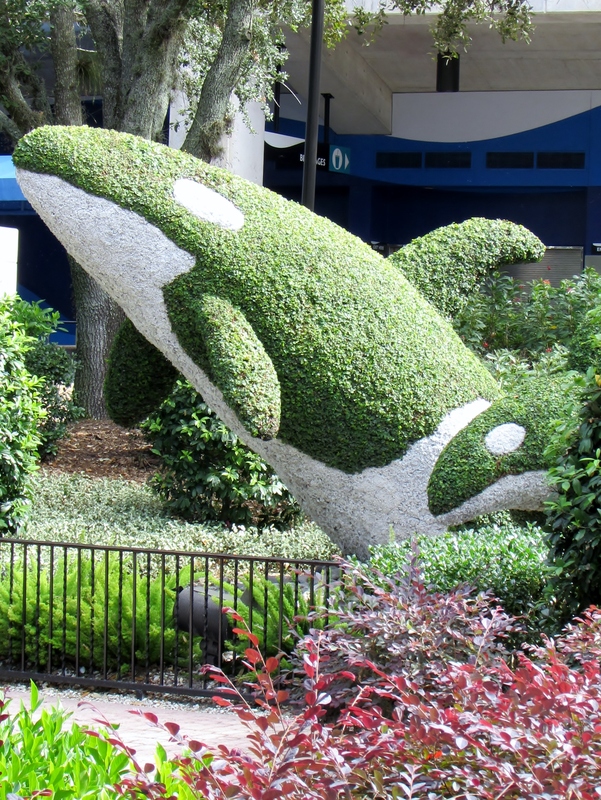 A Shamu topiary, I thought that was pretty cool! I enjoyed seeing what caught your eye. 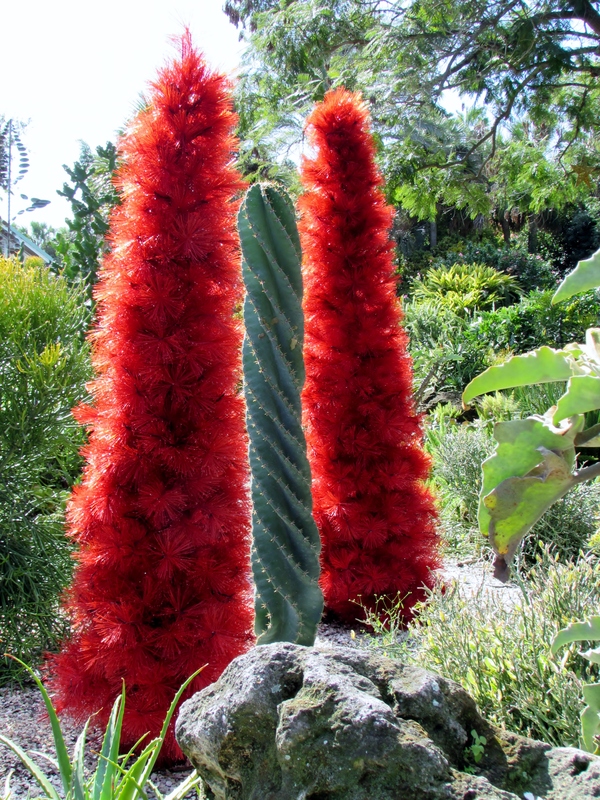 They really do have interesting plants and designs, although I’m off Sea World after having watched Blackfish. 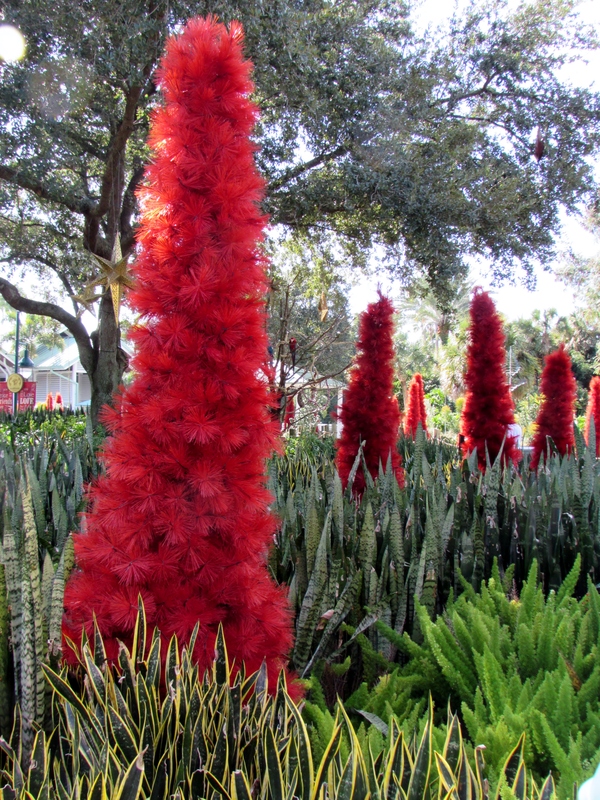 Did you see Disney World gardens too? When I was at Animal Kingdom a few years ago, I saw a sausage tree growing in the Africa theme area. I was astonished because I’d seen them in the wild in Tanzania and never thought I’d see one growing in the U.S. Talk about verisimilitude! I am with you on SeaWorld, i am not a theme park goer anyway but it was interesting to hear about their hopes and challenges. We did go to the Disney World gardens but they wouldn’t let us take many pictures. It was very interesting and I learned a lot there too. I love those photos! and I am so glad to know the plant names….thanks!